The QB8-PVv4 Rock-Ola Nostalgic Music Center Is The Next Generation In Luxury Music Systems For The Home. 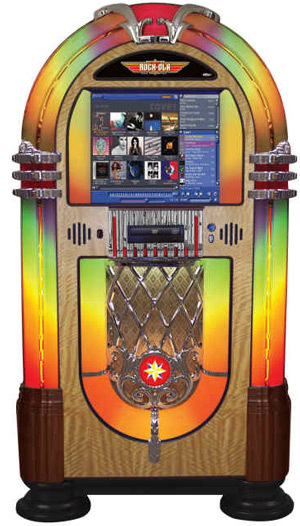 This Rock-Ola Nostalgic Music Center jukebox is a full service music management systeam that allows you to load, organize, and play your CD music collection with a touch of your finger. The cutting edge of Jukebox technology, the latest Rock-Ola touchscreen music center “series IV” features. 19 Inch Touchscreen SATA technology-exclusive to the Rock-Ola Qsonix “drag and drop” system.